PRESIDENT Edgar Lungu described as total falsehood claims by Geoffrey Bwalya Mwamba (GBM) that he was pivotal in the formation and founding of the Patriotic Front (PF) led by late President Michael Sata. According to a statement issued to Daily Nation by Patriotic Front information committee member Sunday Chanda, President Lungu cautioned the people of Northern Province not to fall for Mr Mwamba’s claim that he was popular and could deliver development in Northern Province. President Lungu said in 2001 Mr Mwamba was still “stewing” in hate for having been convincingly whacked by Agriculture minister Given Lubinda when he first contested the Kabwata parliamentary seat, despite having heavily funded the lost campaign. He said the PF later on, through President Sata, took pity on Mr Mwamba and campaigned for him to run in Kasama where he, for the first time, became a Member of Parliament due to the popularity of President Sata. President Lungu, who in the past has questioned UPND leader Hakainde Hichilema’s judgment to appoint Mr Mwamba as a running due to his documented history of violence against his wife Chama, sister-in-law and workers also took time to root for his running mate Ms Inonge Wina. And Kasama Central aspiring candidate Kelvin Sampa said women voters must think twice before voting for Mwamba because “a vote for Mr Mwamba is effectively endorsing violence. President Lungu wound up his Mungwi rally by promising more development for the area in return for the Northern Province continued unwavering support. “It is an undeniable fact that your support ought to be rewarded,” he said. President Lungu later held another rally at Kasama’s Gold Club that got filled to capacity after scares that the Independence Square would not hold the heavy crowd without possible casualties. First Lady Esther Lungu, who accompanied the President, told the ecstatic crowd that her husband would appoint skilled people with disabilities to his Government once re-elected. Pf for Northern province, Eastern, central, luapula, Western, copperbelt, while upnd for Southern only. Yes infact DeadNBC sometimes are ashamed to show the crowds for PF in certain areas whereby they only show the speaker. Its really hard for PF this time because even those that attend I believe they are just promised food or money. Gbm one day will be saying he funded Upnd even if it failed to win. Ironically, President Lungu, his finance minister Alexander Chikwanda, Katuba PF candidate Jonas Shakafuswa and others quickly started dozing even before the National House of Prayer advisory board chairperson Bishop Joshua Banda finished reading the short list of dignitaries present in his salutation. Media-happy ex-priest Frank Bwalya, who is now PF deputy campaign manager, was not to be left out of the dozing irony as he joined the tired VIP officials in the shutting eyes exercise that coincided with the church programme. The dozing officials occasionally opened their eyes to the sound of the clapping supporters, but quickly retreated to slumberland when the clapping died down. For the moments when President Lungu was awake during the service, he was spotted struggling to find the Bible verses that the speakers were calling out to read and he would then give up and start listening. Chakolwa was not there when PF was formed or during its early days. He knows nothing about that party’s history because he is an interloper, a hijacker. Even Miles Sampa has talked about how he had to donate an old LandCruiser for Sata to use. Chakolwa should be decent enough to acknowledge that he came to PF when all was ready and done. People like GBM, Guy Scott and Miles Sampa have better credentials in the origins of PF. HH will not die or faint as Lungu is dreaming. And its very clear, GBM will not remain veep for long, he is a busy business man. But when Sata formed government, he gave the most “sensitive” ministerial position to GBM, defence. No wonder even ECL delayed to let go until he gave it to a yes man kind of guy he can control 24/7. Do not be bothered. An average Zambian worker works less than an hour. Rest of the time, he criss crosses internet, gossips, takes two hours lunch break, spends more than 45 minutes a day on sipping tea-4-5 times a day, using office phones to sell and collect money for his personal business and rest of the time begging, more begging and more begging for funerals, kitchen parties, as if the deceased was a relative of everybody and the would-be bride will be a common property of every contributor. Let these kaponyas be on the roads, in rallies and grocery stores than in offices. When HH takes over, these kaponyas will be shown the doors to their villages to go and plough the land and live happily everafter! The only truth about GBM is that he is a WIFE BEATER! PF is playing defense in their own stronghold. This is a telling state of affairs. VIVA HH and GBM, the Tonga Bemba alliance is powerful, no one can stop it. THE ONLY THING LUNGU HAS DONE FOR PF, IS TO GET EVEN MORE DRUNK THAN EVER!!! Chakolwa WAS DRUNK WHEN HE UTTERED this CRAP!! GBM made Sata win and today Lungu has chucked out the Sata Family who fought so hard for PF. PF is gone with the Sata family. It was Sata himself who made that statement when his and wife’s vehicles were taken away by the ACC. Sata produced a bank statement that showed $100,000 transferred from GBMs Finance Bank account to Sata’s personal account. The issue was all over. According to Sata, GBM bought the vehicles Sata used in his campaigns. 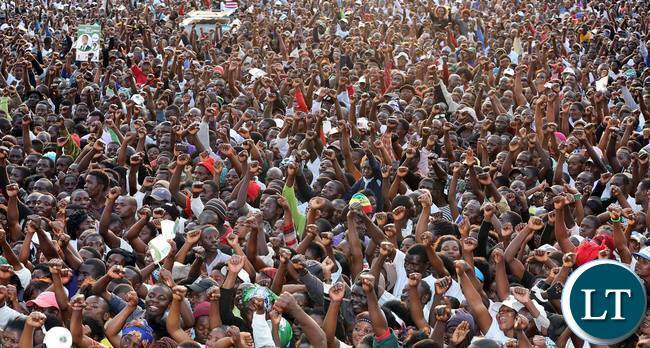 @MK…and in 2015 ECL was hardly known by the majority of Zambians whilst HH had been on the scene for “donkey” years and had campaigned for the three months, whilst ECL had only campaigned for less than 21 days and could not even cover 50% of the voters in the country ….indeed, let’s wait for August 11. ECL THERE IS NO WAY OUT, BUT TO CONTINUE IN AS THE PRESIDENT OF ZAMBIA, AFTER BEING BLESSED BY THE POPE. Its in public domain that GBM bank rolled the PF campaigns in 2011.How much did you contribute? Kiswapako. …and he did. He also gave it up on principle. You on the other hand did not and have nothing to your name! See the difference? GBM and Dr. Mahtani who bankrolled Sata’s campaign. In exchange Sata gave Dr. Mahtani his bank back and to GBM the portfolio of Defence. RB was vindictive and so is Lungu. HH will put businesses in private hands and bring prosperity to Zambians. He has lived his entire life by example and will create a modern Zambia for all. I see a crowd of people in the rising dust….. This is a childish argument by Edgar Lungu. Who doesn’t know that it was very GBM and a few others who bankrolled the PF in 2011. By the way, how can much did you, Edgar Lungu, contribute to the PF in 2011, if in 2015 you only had K3,000-00 in your account? This is a childish argument by Edgar Lungu. Who doesn’t know that it was GBM and a few others who bankrolled the PF in 2011. By the way, how much did you, Edgar Lungu, contribute to the PF in 2011, if in 2015 you only had K3,000-00 in your account? Lungu can spin the dice the truth is Gbm heavily fumded pf,it cant be erased from pf history.its better to appreciate and talk about economic recovery plan not gbm every time.remember dull people talk about other people and food.are u in the same category? Bembas and Easterners are beatiful like diamonds in the sky and will shine for President Lungu come 11 August 2016. “It is an undeniable fact that your support ought to be rewarded,” – you need to take this message to all your strongholds and apologise for having neglected some of the areas where you have your strongest support in pursuit of acceptance in areas which harbor politics of ethnicity and regionalism. Just do so and tell your campaign teams on the ground to explain your way out! Part of the apathy from PF strongholds was that they could not vote UPND but had been let down by PF for not doing what they had promised! n the Bible, the number 6 symbolizes man and human weakness, the evils of Satan and the manifestation of sin. Man was created on the sixth day. Men are appointed 6 days to labor. A Hebrew slave was to serve six years and be released in the 7th year. Six years were appointed for the land to be sown and harvested. The number 6 is also associated with Satan in his temptation of Jesus. LET US QUICKLY USHER IN THE 7TH PRESIDENT IN ZAMBIA.GOD OUT OF HIS MERCY MADE OUR SIXTH PRESIDENT TO SERVE A SHORT TERM SO THAT OUR SUFFERING IS NOT PROLONGED. @ Tolilo, the name of the 7th ( complete ) president for this Christian Nation has to be HH as can be derived from the tetragram name of God, YHWH. On shortest reign, arguably the weakest Zambian National Team became the shortest reigning Africa cup champions in 2012 from the very land, Garbon, which the devil killed our stronger national team in 1993. All these events speak volumes about man’s weak standpoint to archive his goals against God’s divine ways of fulfilling His plans. Man can talk or do anything but God’s will always prevail for this Christian Nation. Point of correction. It’s not on pf but hh. WAIT for police to finish investigation. Mapenzi was recorded on video before she was killed. The important thing is to give a message to the voters. The past is gone and voters want plans for the future. The economy is broken so what will Lungu do to fix it? Well HH has a Ten Point Plan so lets give him a chance to implement it and if he fails to change our lives we vote him out. Lungu has failed so we have no choice but to try HH. Continuing with the violent and visionless Lungu is like committing suicide. Forward with HH,GBM and UPND. BECAUSE OF COPY AND PASTING STORIES, LT, HAS COPIED AND PASTED THE STORY FOR KASAMA ONE OR TWO WEEKS AGO. THE PICTURES AND THE STORY/ARTICLE DO NOT MATCH. ATI JOURNALISTS!! God does not punish anymore you *****! Its about the the formation of PF and not the campaigns. Zambian Reading culture too prejudicial. @God’s Creation, ECL did not say GBM did not fund PF in 2011, he said he was not there when PF was being formed as GBM claims. So if GBM funded the party which he joined later no body forced him to do so actually he was not the only one who did that others contributed in other ways money is not everything. Umunweumo tausalenda, you can only achieve something when you get together. and the truth is that GBM was covering up Sata for money laundering (USD100,000) otherwise Sata was going to be locked up…people should ask Kaseba-Sata! You lie my friend. The Post must have gone to the wrong address. The National Prayers I attended on Sunday 24 July @ the Show Grounds were awesome, lively & Holy Spirit filled. We prayed, praised & worshiped with the President that even God manifested Himself. The pictures are there for you to see. Your idea of flop is laughable. This event was far more successful than the LAZ event which only had a handful of people with the climax being a set of speeches. Let me disappoint you & the Post further; God LOVES Zambia & his has been hearing our prayers; God will not allow you to put Zambia on fire; God has already answered our prayers & God is Blessing Zambia! How come you were nothing but a Deputy Minister when we formed government 5 years ago? GBM’s contributions were there for all to see. Mr. Empty head Lungu you are wasting our time sela babombeko abanobe!!! The perennial presidential candidate in Zambia, Hakainde Hichilema has built his fortune on fraud and corruption. He stole from the Zambian people. HH defrauded Zambians by giving state-owned Mosi-oa-Tunya hotel to himself. He took Agriflora’s money by putting the company into receivership and appointed himself as liquidator. HH wants to be president not because he wants to help anyone. He wants to be president because it would allow him to steal some more. His candidacy is an insult to the Zambian people. “You should thank me for stealing from you”, this is what Hichilema is telling Zambians when asked about the money he acquired from privatisation. “Are people not proud that there is Sun Hotels? Are people not happy that there is Royal Livingstone and Zambezi Sun?” – Hichilema shamelessly asked during a radio address on 19 January 2015. Instead of apologizing, Hichilema chose to insult Zambians. After stealing some of the country’s most valuable enterprises, after selling Zambia’s hotels, banks and mines, after forcing Zambians into poverty, Hakainde Hichilema is asking people to be grateful for his wealth and vote for him in the presidential election. HH candidacy seems like a slap in the face to the Zambian people. Due to Hichilema’s management of privatisation, Zambians lost at least 15 million dollars. Not only that the hotel was sold very cheaply, but Sun International received all kinds of concessions which all other investors were not given. The $15 million entered into Hichilema’s pocket. HH chose the lowest bid because he negotiated the sale of the state-owned hotel with himself. Although he failed to declare conflict of interests, HH was the owner of the Sun International Ltd at the moment of the sale. Hichilema was entrusted to sell a valuable property belonging to Zambian people. He defrauded Zambians by giving their property to himself. exporter of vegetables and flowers, defaulted on a $16 million debt to Barclays Bank. The management of the agricultural company tried to ask for time to revive and pay back the loan, but the bank’s Board of Directors refused. The Chairman of the Board of Directors of Barclays Bank Zambia Plc was Hakainde Hichilema. After forcing Agriflora into receivership, Hichilema appointed a liquidator to the company. Without declaring interest, Hichilema assigned his own firm, Grant Thornton, to liquidate Agriflora. As revealed by zambiaawakens (link), thousands lost their jobs after Grant Thornton decided to close Agriflora. It was Hakainde Hichilema who profited from the Agriflora collapse. And he did it twice: first as Barclay Bank chairman and second as Grant Thornton owner. Paul lungu/whatever they call you,the best you can do for us is to shut up.your were not born at the time and cannot understand the rationale behind privatisation you scatter brain ! At every rally Lungu only talks about HH, GBM and the UPND (punctuated by dances to sexually suggestive music lyrics) Is he having nightmares about them? When is he going to reveal his vision, plan for Zambia or indeed what the so-called PF manifesto says? Is it because reading is a problem for you? The PF Manifesto (not a 10 Point wishlist) is everywhere. Take time to read if you want to be a better critique. I have even stopped reading what comes out of Edgar’s mouth. So what is the topic mwebantu? WHY DENY THE TRUTH. GBM DID PUT IN ALOT OF MONEY IN THE PF AND THAT IS WHY SATA GAVE HIM THE P0SITION OF MINISTER OF DEFENSE AND HIS COMPANY TO SUPPLY THE ARMY ETC. SO BA LUNGU , GBM DID FINANCE PF. At first they said GBM is not a factor, but talk about him in their sleep, when eating, when campaiging, believe even in their prayers. true massive harm to the country, that is what Lungu has done. In the Bible, the number 6 symbolizes man and human weakness, the evils of Satan and the manifestation of sin. Man was created on the sixth day. Men are appointed 6 days to labor. on behalf of govt. And when people complained through the post gbm responded that yes he joined politics so that he can make money. I don’t dream but state whats on the ground. UNPD is getting Western, North Western, Southern, Centrel and Copperbelt. You dont have to be a clever person just look where each party is spending more time. Lungu has been to Luapuala, Northern and Muchinga more then twice in the last one month. His bet is to get the bemba speaking votes, next week he will try to capture Copperbelt for more Bemba speaking voters. So do you calculations the decider is Copperbelt and Lusaka Province. So this only leaves one option, ECL is going to rig because he knows he will not win the first round, or maybe even the elections. Inflation at 22%, Elections on 11th, then the Winner should be HH th. Whether upnd like it or not,PF will win Luapula,Northern,Muchinga,Eatern,CB and Lsk while upnd also shall win southern,western and n/western! !people have already decided and only waiting for voting on 11/08/2016! !go PF go!! Which people will vote for continued poverty and corruption under Lungu PF? Owe bombs chapwililika. It’s HH’s UPNDestruction on collision trajectory with a heavy and embarrassing 6th time defeat. GBV-M is lying between his thick teeth. Viva ECL. Zambian ‘s votes are secured for you. Ifintu no Egadr or sorry, Edgar. Sontapo iwe. Owe nomba chapwililika. It’s HH’s UPNDestruction on collision trajectory with a heavy and embarrassing 6th time defeat. GBV-M is lying between his thick teeth. Viva ECL. Zambian‘s votes are secured for you. Ifintufye ni Egadr or sorry, Edgar. Sontapo iwe. Pali GBM kwena ba HH mwalizaula.its a very big mistake to have a wife beating foul mouthed man as running mate. Women voting for you will be endorsing ukuponokwa. Ba Mrs Lungu proper first ladies don’t involve themselves in husband’s politics. We all know where your bread is buttered so just shut up. The number 6 6 6 has its significance, watch the number 7, (completeness). Something is about to happen to my motherland. God has heard the suffering of His people. Soon and very soon. We will be delivered. Hold tight, few more days to go. New President, New beginning. Excitement only. It’s plain for all to see that the thieving drunkard is a simple one track mind that discusses people and never national issues, and he is the president!